Kitchen Cow 3rd Anniversary Giveaway Winner! Finally, we have a winner! Taking home the bento set we’re giving away is karissa, who plans to use the set for her work lunches. I guess nothing beats home cooking in the middle of the working day, especially when it’s something home cooked by her mom. Congratulations karissa! Expect your bento set this week or next. And to those who sent their congratulations for the site’s anniversary, my thanks as well. Crossing my fingers that there will be more anniversaries to come! I’d say more giveaways too, but I don’t have to cross my fingers for that because I KNOW for a fact that there are a couple in the pipeline. So, please come back for more. Who knows what you’ll stumble upon. I can has Twittar. Follow you can. Forgive me if I’m being stupid on Twitter though, I’m still trying to get used to it. This entry was posted in admin, culinary events and tagged baon, bento, cow, freebie, giveaway, kitchen, kitchencow, promo, winner. Bookmark the permalink. 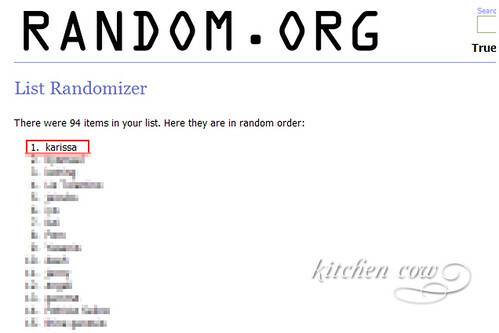 12 Responses to Kitchen Cow 3rd Anniversary Giveaway Winner! aww! am envious, ehehe! congrats karissa! you’re one such lucky gal! Kaoko, is that a hint that there’s still more giveaways to come *big grin*? anyway, im so looking forward to your next bento giveaway! I’ve replied to your email Kaoko! Yipeeeeeeeeee! congratulations karissa! lucky, lucky, lucky! kaoko, for sure there will be more anniversaries for you and your site. you’ve got the perfect recipe here and i’ll definitely look forward on your next anniversary and give-away. Thanks for joining! 😀 Mebbe next time? Congrats! You lucky person, you! Grats again to the winner, and to kitchen cow for it’s 3rd year! Wow, bento set for you karissa! Conga rats! Kaoko, conga rats to you too for KitchenCow’s third annive! Oh, this is so nice! I wish I knew about this contest earlier. Happy anniversary! My tarot/New Age blog’s about to be 3 years old soon, too. I hope I’d be able to have the bento set pretty soon! My apologies. I sent you an email about it but I think it bounced. I haven’t had the chance to drop by the courier but will let you know as soon as I’ve shipped.